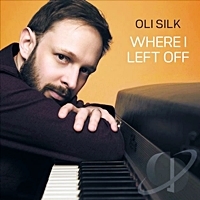 Smooth Jazz keyboard wizard Oli Silk delivers a fine album in ‘Where I Lift Off’; it is a mix of smooth melodies, fine grooves and Fusion tinged numbers. On the melodic side check ‘Ooh Baby’ and the lilting ‘Take Some Time Out’ that features Peter White. There are 2 vocal tunes, a strong cover of Joe Sample’s ‘Burning Up The Carnival’ and the riff laden ‘Music Without Sound’, both feature the voice of Katie Leonie. The upbeat ‘Suits You Sir’, the Latin flavoured ‘Su Casa Mi Casa’, the grooving ‘Catch My Breath’ and the slower ‘Cluster Funk’ illustrate the more Fusion orientated style of Smooth Jazz. Guests include Steve Cole, Rick Braun, Althea Rene and Nick Colionne as well as White. Top notch Smooth Jazz.